Diesel trucks and buses with a GVWR that is 14,001+lbs must reduce exhaust emissions by meeting particulate matter (PM) filter requirements and upgrading to 2010 model year (MY) or newer engines. Diesel vehicles with a gross vehicles weight rating greater than 14,000lbs. Any person, business, school district, tribal reservation, or federal government agency that owns, operates, leases or rents affected vehicles. On August 1, 2018, Cummins initiated a recall of the Selective Catalytic Reduction (SCR) unit catalysts in their 2010 to 2015 model year medium and heavy-duty engines. This recall affects over 500,000 heavy-duty vehicles nationwide. Customer letters for the first phase of the recall were sent to vehicle owners by Cummins starting August 1. Vehicles are to be brought to a Cummins certified service location for replacement catalysts and/or software upgrades. For assistance, including locating your nearest Cummins certified service location or determining whether your engine is covered by the recall, please contact Cummins Care on the web at https://care.cummins.com or call Cummins at 1-800-CUMMINS (1-800-286-6467). •	Cummins will reimburse cost of previously replaced catalyst. •	California Department of Motor Vehicles may require the completion of emission campaign repairs prior to vehicle registration renewal. shown in the table below. The table will be updated, as new engine families are included in the recall campaign. these four engine families only will not be mailed out. School Bus Vehicles powered by diesel fuel with a Gross Vehicle Weight Rating (GVWR) of greater than 14,000 pounds that provide transportation of any school pupil at or below the 12th-grade level or to or from a public or private school, or to or from public or private school activities are subject to the Truck and Bus Regulation. Previously, school buses that could not be retrofitted (e.g. 2-stroke engine buses), could delay their compliance until January 1, 2018 with an approved extension. In 2014, to void the flexibility options provided in the 2014 amendments to the Truck and Bus regulation (regulation), John R. Lawson Rock and Oil of Fresno (Lawson) and the California Trucking Association (CTA) sued the California Air Resources Board (CARB) in Fresno County Superior court. In 2016, that court ruled in favor of Lawson and CTA, ordering CARB to set aside the regulation’s 2014 amendments. CARB appealed that decision to the 5th District court of Appeals. On January 31, 2018, the appellate court issued its decision upholding parts of the lower court’s ruling, including the court’s direction to set aside the regulation’s 2014 amendments. If vehicles in your fleet are using one or more of the flexibility options that CARB added or amended in 2014, you will be impacted by the court’s decision. On January 1, 2020, a new enforcement tool will ensure that vehicles subject to the California Air Resources Board’s (CARB) Truck and Bus Regulation must meet the health-based requirements of that rule prior to obtaining registration through the DMV. Any registration due after December 31, 2019 is affected. Beginning January 1, 2020, the Department of Motor Vehicles (DMV) CANNOT register any vehicle that does not meet the requirements of the Truck and Bus Regulation. What if the DECS fails outside of the warranty period? 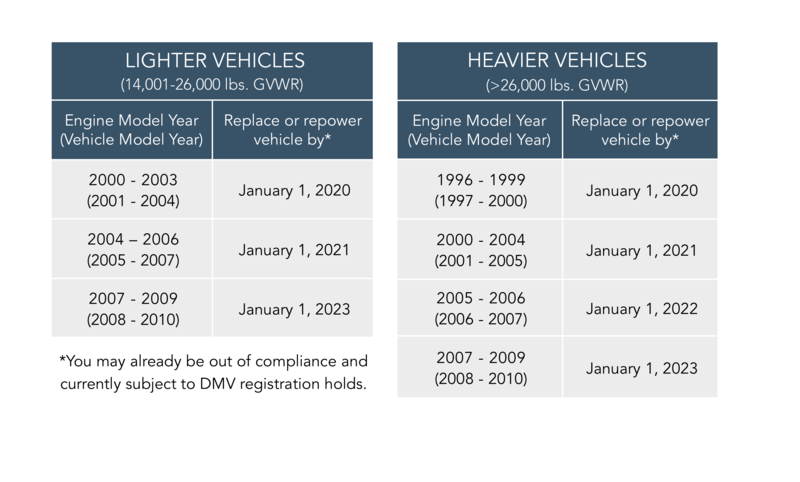 Light vehicles (14,001-26000 lbs GVWR) with Engine Model Year 1999 need to be replaced or repowered to a 2010 or newer model year engine. Deadline to report in TRUCRS for flexibility options, and report any changes to your fleet. 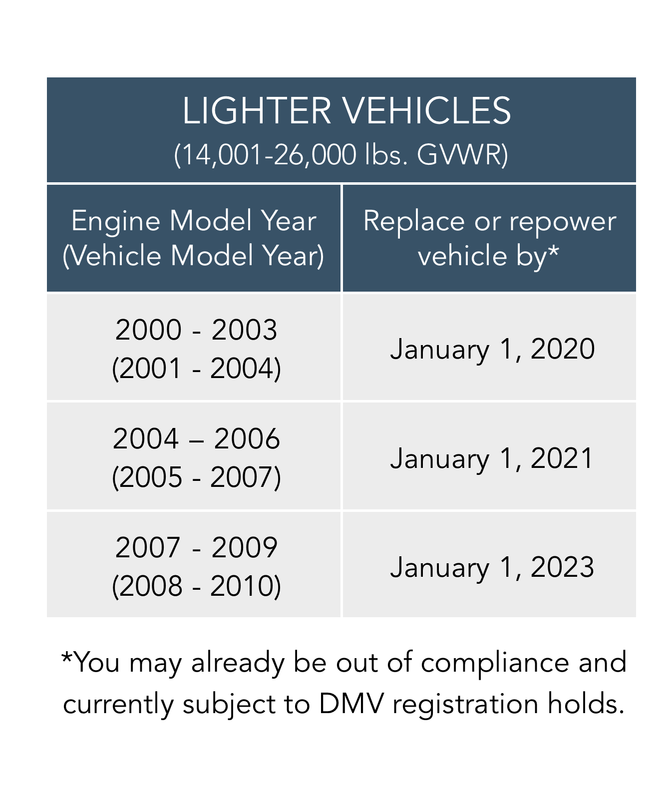 Light vehicles (14,001-26000 lbs GVWR) with Engine Model Year 2003 or older need to be replaced or repowered to a 2010 or newer model year engine. 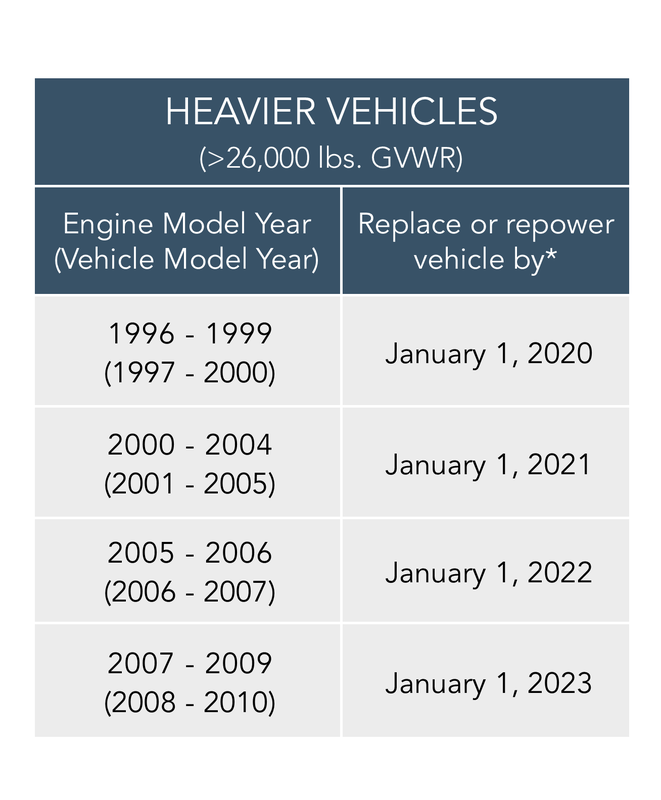 Heavy vehicles (Greater than 26000 lbs GVWR) with Engine Model Year 2000 or older need to be replaced or repowered to a 2010 or newer model year engine.